Sunday, November 4, 2018. 8:00-10:00 PM. 40th Season “Grande Opening Concert.” Robert Longfield, Music Director; Gary Green, Guest Conductor. Guest Clarinet Soloist, UM Associate Professor Margaret Donaghue. Tuesday, March 26, 2019. 8:00-10:00 PM. “Spring Spectacular Concert,” Robert Longfield, Music Director; featuring guest conductor Col. Arnald D. Gabriel and Guest Alto Sax Soloist Dale Underwood. Tuesday, May 7, 2019. 8:00-10:00 PM. Twenty-first Annual ‘Pops’ Concert.”It’s Showtime! : Stage & Screen Classics.” Robert Longfield, Music Director. Steven Moore, Guest Conductor. Tuesday, June 11, 2019. 8:00-10:00 PM. 40th Season “Grande Finale Concert.” Featuring the greatest music of the symphonic band repertoire. Robert Longfield, Music Director. Barry Bernhardt, Guest Conductor. Sunday, February 17, 2019. 3:00 PM. (Approx. 80-minute concert). Robert Longfield, Music Director. Sunday, December 9, 2018. 3:00 PM. (Approx. 80-minute concert).Robert Longfield, Music Director. Steven Moore, Guest Conductor. Sunday, April 28th, 2019. 4:00-5:30 PM. featuring Band members and friends in solo and small ensemble performances. The Gusman Concert Subscription Series is made possible with the support of the City of Coral Gables. Individual concert tickets are $15 for Adults and $5 Students/Children (over 5+ years) and are available at the box office on the night of the concert, or in advance online HERE. Cash, check, and all major credit cards accepted. All concert dates and guests are subject to change. If ordered online, you will receive an e-mail confirmation following your order. Should you have any questions, please call the GMSB office at 305-273-SOUSA (7687). All dates, guest conductors/performers, and prices subject to change. If you lose your tickets, please call us at 305-273-7687. Orders placed fewer than 10 business days prior to concert date will be held at the Will Call table for pickup on the night of the concert. Gusman Hall Concert Series tickets are available at the Gusman Concert Hall Box Office on the night of the concert, starting one hour before the performance, or at the GMSB Will Call table located inside the lobby. 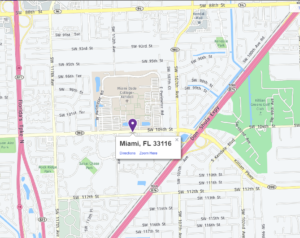 Pinecrest Gardens, Banyan Bowl, Concert tickets are available at the GMSB Will Call table located inside Pinecrest Gardens (please note that your ticket purchase includes admission to Pinecrest Gardens after 2PM on the day of the event only). Cash, check, and credit cards accepted onsite on the day of the events. All seating is General Admission. There are no reserved seats for any events. There will be a $1.00 convenience charge added to each ticket purchased online using a credit card. ♪ A written application (personnel sheet) is submitted to the Personnel Manager. ♪ A successful audition is completed. ♪ Current membership dues have been paid. ♫ Please send us an e-mail containing your name, phone number, and instrument if you are interested in joining the band. ♫ Dues are currently $70.00 per year, due the first rehearsal in September; OR, $35.00 per “semester”, due the first rehearsal in September and the first rehearsal in February. ♫ The rehearsal and concert season runs from September through the last concert in July. Rehearsals will be Tuesday nights from 8:00 P.M. to 10:00 P.M. Earlier starting and later ending times, and additional rehearsals may be scheduled. ♫ Attendance will be taken at every rehearsal (and at the break) and at concerts. Members are expected to attend all rehearsals, including pre-concert rehearsals, and perform in all concerts. TURN OFF PHONES AND BEEPERS! ♫ Members shall be dropped from the roster for three consecutive unexcused absences. Non-attendance at a pre-concert rehearsal and/or non-payment of dues may preclude the member from performing in that concert. Also, one of the criteria for seating placement is attendance. Unnecessary and excessive talking during rehearsal will also be grounds for dismissal. ♫ If you are not able to attend a rehearsal or concert, please contact the Personnel Manager as soon as possible or at least before 4:00 P.M. on the day of the rehearsal or concert. ♫ All members are expected to adhere to concert dress guidelines for Indoor and for Outdoor performances. Concert dress is determined by the Board of Directors and shall be announced. ♫ Dues-paying members only may take music folders home for practice. All folders must be returned for the next rehearsal or concert. If you are unable to attend, you must make arrangements for returning the folder. Folders are to be returned to the storage box at the end of the rehearsal or concert. Members are urged to mark parts, but do so in pencil only. ♫ Members are also encouraged to help in other ways. Please ask the President or a Board member how you can help. If you have any questions about the Greater Miami Symphonic Band, contact a member of the Board of Directors. 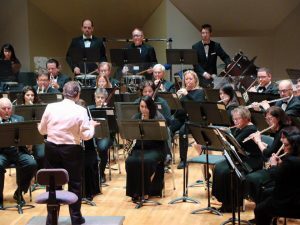 Through the years, community bands have been a principal exponent of American musical culture at the grass roots level, playing for social and ceremonial occasions in bandstands, town halls, and auditoriums. 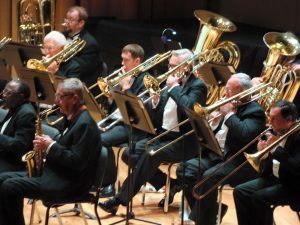 Community bands provide a means for continued musical expression by thousands of talented performers and an important cultural source for audience members. 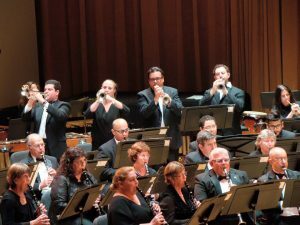 In 1979, keeping with the spirit of this great American tradition, South Florida based musicians founded the Greater Miami Symphonic Band. 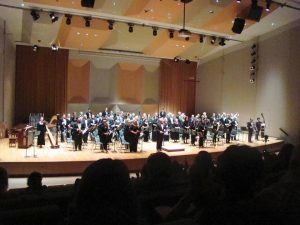 The band’s mission was, and continues to be, to provide audiences with high quality symphonic band music, to highlight the diversity of wind band repertoire in performance, and to give regional musicians a gratifying artistic experience. 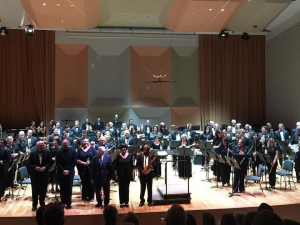 Concerts often feature guest conductors, composers, and soloist, who travel from around the country to perform with the talented, growing ensemble. Comprised of a diverse group of community members who volunteer their time and talents to the band, GMSB musicians share a common dedication to the study, performance and support of great music. 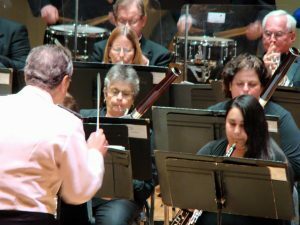 Public performances at both concert halls and outdoor locations give South Florida residents a connection to the beautiful and wide-ranging symphonic band literature. Did you play an instrument in high school or college? Fine musicians are invited to inquire about auditions and placement opportunities. For more information, please contact us at (305) 273-7687 or send us an e-mail here. (click Join). LIKE US on Facebook and become part of the conversation. Find us at www.facebook.com/GreaterMiamiSymphonicBand. To receive updates on all GMSB activities, choose a method below that best suits your needs. CALL US at (305) 273-SOUSA (7687) and leave a message.